Is Chattanooga falling behind on its growth forecast? 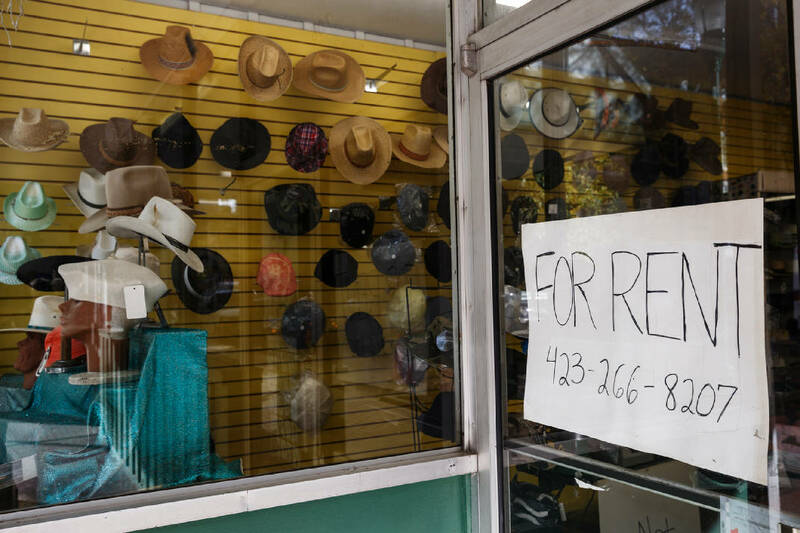 A "For rent" sign is seen in the window of the Downtown Mart shop on Market Street on Friday, Nov. 16, 2018, in Chattanooga, Tenn.
Chattanooga's image is important business, and big money has been spent selling the Scenic City as a hot market to investors and business owners. In the past three years, $1 billion dollars of private investment has flooded downtown. The frenzied pace of development. The creation and national promotion of an Innovation District. The construction of a new $10.6 million Miller Park. Downtown remains central to the recited success story. But a short walk down one of the city center's main arteries might make one wonder if a bubble has burst. Signs advertising buildings for sale or lease pepper downtown. Right now, 15.6 percent of office space sits unused, and downtown apartment vacancy has jumped to 7.4 percent from 1.9 percent in 2013 as more developments contend for tenants, defying widely held assumptions about demand for higher-end rentals in the heart of the city. In the tourism area, near the Tennessee Aquarium, prominent restaurant space remains empty. Meanwhile, long-term tenants have pulled up their stakes. "I was told it was going to be amazing, how many thousands of people are moving downtown. I was very excited about that," said Gina Bennett, owner of Sing It or Wing It on Market Street. "We have lots of empty apartments. My kids who work for me can't afford it." Behind-the-scenes, local leaders are expressing concern. The image doesn't fit the narrative. By traditional economic measures, Chattanooga is doing wonderfully. The area can accurately boast of low unemployment, job and population growth and rising home and commercial values. The U.S. economy has been enjoying the same degree of optimism. In late September, the U.S. Census Bureau released data showing an increase in the metro area's median household income between 2016 and 2017. When compared to 382 other metro areas, the six-county Chattanooga region experienced the sixth-fastest growth in median household income over that single year. Hourly wages for employees across all sectors in the Chattanooga metro area have risen 13.8 percent between March 2013 and September 2018, according to the U.S. Bureau of Labor Statistics. "Simply put, Chattanooga is one of the most desirable and dynamic economies in the nation," Chattanooga Mayor Andy Berke said in an email. Other measures, though, point to a different reality: Cities are in an accelerating fight for talent and capital as the nature of work continues to rapidly change and technology allows more consolidation, and in this race Chattanooga is falling behind, data shows. Historically low interest rates, paired with the rapid increase in local property values enticed many to buy into the downtown market. Local and national experts, however, are beginning to warn of a downturn. REIS, a national company that provides market analysis and data for the real estate industry, reported in October that metro Chattanooga's third-quarter, apartment vacancy rate increase of 0.9 percent to 6.2 percent total vacancy for the quarter was highest among the 45 metro markets where vacancy rose across the country. Downtown vacancy — 7.4 percent — was highest of all three local submarkets tracked in Chattanooga. Thirty-four other markets, including Birmingham, experienced a decline in apartment vacancy. In the first quarter of this year REIS reported that Chattanooga was the only market that posted apartment rent decline. This spring, officials announced the The Clements Lofts would be transitioning to a boutique hotel. The Maclellan Apartments — built by a Memphis developer who received federal tax credits and a local tax incentive in 2015 to renovate the underused and historic Maclellan Building — has also considered converting to a hotel, according to minutes from a recent meeting of the city-run Health, Educational and Housing Facility Board. When asked, officials with Heritage Properties, the Maclellan developer, said they did not have plans to convert the apartments. "Did we guess wrong about demand? Maybe we needed more family rentals that skewed affordable," said River City Co. CEO Kim White. "Is there more of a desire for homes near downtown than imagined? Perhaps it is more desirable to live a little bit out from downtown with a house." River City's emphasis on market rate rental developments downtown was well informed, however. A downtown market analysis — commissioned by River City and published in 2016, right as many development projects were getting off the ground — predicted the area would need an additional 2,388 market rate apartments by 2018. "With strong forecasted job growth, Generation Y hitting prime rental years, and an increasing preference for renting, we are projecting an average of 14.9 new apartments absorbed in the metro per every 100 new jobs in the metro," the market analysis by Noell Consulting Group read. National experts expressed similar enthusiasm. At the end of 2015, as the downtown market analysis was being completed, REIS reported that Chattanooga was a turnaround market to watch. Then, apartment vacancy sat at 4.9 percent and was falling. Brookings Institute scholar Bruce Katz wrote glowingly about Chattanooga in an online essay: "2015 has been dubbed 'The Year of the Crane' as $480 million in private investment is fueling the construction of hundreds of hotel rooms and thousands of apartments. Something special is happening in Chattanooga." In June, River City Co. hosted a weekend walking tour to showcase 14 developments with available units downtown. Attendance was robust. More than 500 people came to see the insides of Market City Center, Passenger Flats, Bluebird Row Apartments, the Tomorrow Building, Mcclellan Apartments, Douglas Heights, The Edge, Vista Cameron Harbor, Exchange Cameron Harbor and 10 North, among others. The crowd, however, skewed far older than expected, White said. Many were boomers looking to downsize and own in downtown. Several expressed disappointment with the offerings. At Passenger Flats — where remodeled Chattanooga Choo Choo Hotel rooms and suites are available for rent for between $800 and $1,950 a month, including utilities and internet service — groups going in and out of the display units expressed astonishment at the price tag per square foot. "This is just a hotel room," a woman told her friend, pointing to air conditioning unit by the window. "They barely changed anything." Curious shoppers on the downtown living tour this summer also seemed surprised by the price and size of the apartment offerings at Market City Center, the new $30 million, 10-story retail and apartment building in the heart of the city on Market Street with 122 units. A leasing agent on site encouraged potential residents to check back on prices later, adding that low demand would eventually lower the rent. In October, Market City Center was advertising one-month's free rent for those who signed a lease. Passenger Flats was also advertising a one-month free rent promotion for four of their five floor plans. Bluebird Row, a new apartment complex next door, which is renting 283 units, starting at $1,100 for a 630 square-foot studio, was also offering discounted rent and fees for those who sign a lease. A digital advertisement for Bluebird Row last week offered one month free rent and "up to $2,000 in gift cards on select units." For example, metro Chattanooga's gross domestic product per capita, an important measure of prosperity, increased in recent years to $46,190, but its growth rate — 2.33 percent — ranked 88 out of 100 in a Harvard University analysis of economic competitiveness. In 2001, the area's GDP per capita ranked 22. By 2016, it slipped to 36. What was the new median household income that made headlines? In 2017, just $50,250. The typical Chattanoogan earns 22 percent less than the typical American. Chattanooga's median income was also the lowest among Tennessee's four major metros. And though there was some wage growth, the real bump came from added jobs, labor data shows. The recent loss of 160 marketing, sales, research and development jobs at Sanofi, the French pharmaceutical giant that purchased long-time Chattanooga company Chattem in 2010, doesn't help. "There is a delicate balance between keeping on a brave face to keep everyone's attitude right and telling the truth about the way things are," said Tim Kelly, who sits on the board of River City Co., the nonprofit charged with promoting and animating downtown. "That is a dynamic tension that we always have to navigate." Berke said his administration has prioritized "quality, high-wage jobs," as well as an equitable economy. In May, he told Fortune magazine, which called Chattanooga "one of America's most start-up friendly cities," that the city was growing income "as we add higher-skilled jobs." Federal data, however, shows the metro area has not yet attracted the glut of higher-wage jobs needed to support the city's explosion of luxury developments. Cat Martinez, apartment manager at Passenger Flats, said the vacancy rate is due to the increase in development of brand new apartments, which is good for Chattanooga. "For investors and developers there should be no reason for concern; this is a part of the natural growth in a city's livable spaces," she said. "All other mid-sized cities surrounding us have been ahead of the housing/development curve; that explains why they've posted decline and we haven't. We're still building." John Wise, who owns several apartment developments including Hayden Place Apartments near North Chattanooga and the new Henry Lofts downtown, had a different take. It does take time for a development to stabilize. However, Wise believes the apartment market could be tipping into a cyclical downturn. "For the first time in 10 years, I am struggling with lease up," Wise said. "I am having to give away a month or two of rent. It is the first time." Multiple attempts to speak with representatives of Market City Center, Bluebird Row Apartments and other developers were unsuccessful. Construction projects across the city promise many more units. According to estimates, more than 3,000 apartment units, nearly 2,000 student beds, and 250 condominiums and townhomes have recently opened or are coming online within the next year or so. At the beginning of September, a South Carolina developer announced another project, which promised to put 151 apartments, a dozen townhouses and 16,000 square feet of office and retail space apartment and commercial project on a pair of Unum Group parking lots near the riverfront area. And this month, developers announced a $3 to $4 million project with 41 apartments and retail space on East M.L. King Boulevard. It's good or bad news, depending on who you are, said Kelly, who also serves on the Chattanooga Area Chamber of Commerce Board. If the rental market remains saturated and more apartments enter the competition, those who want to move into downtown or stay downtown — but cannot afford the rising costs — will win because rents should fall, he said. In 2017, rental rates rose nearly five times faster than worker wages in Chattanooga, a survey of apartment rental rates by Zumper found. Developers and their lenders won't be happy, however, because neither will get the return they expected, Kelly said. So what happened? Where are the renters developers expected? "All of this housing was built at an anticipated price point expecting job growth would happen and the fact that it hasn't happened as rapidly as hoped means there is a gap that has to be filled," said Kelly, who owns several local businesses including Kelly Subaru and Chattanooga Brewing Company. "You can't escape the economics. We can't expect to attract a working age population without healthy job growth in the industries that employ those people. "That is still a work in progress. I am not saying that is a lost dream or that we are on the wrong track, but it seems supply has overshot the demand at this point." Almost all cities, including Chattanooga, are growing as the U.S. population continues to pull in from the suburbs and rural areas toward urban hubs. This is a well documented worldwide phenomenon, as well. Chattanooga added nearly 2,000 more residents in the city in 2017 — the most of any year since 2010, according to U.S. Census Bureau data. Between 2012 and 2017, Chattanooga's metro area population grew 3 percent. The number of jobs grew by 8 percent in the same time period, data shows. By comparison, the Huntsville, Alabama, metro area, grew its population by 6 percent and jobs by 10 percent in the same time period. The Charleston-North Charleston, South Carolina, metro area grew its population by 11 percent and jobs by 15 percent. The Durham-Chapel Hill, North Carolina, metro area grew its population by 8 percent and jobs by 9 percent. The Savannah, Georgia, metro area grew its population by 7 percent and its jobs by 13 percent. The Provo-Orem, Utah, metro area, a comparable metro to Chattanooga outside the South with a population of around 617,000, was named the best performing large city in America in 2017 by the Milken Institute, a California-based, nonpartisan think tank that publishes a best performing cities rankings each year. In that metro area, the population grew by 12 percent and jobs grew by 28 percent in the same time period. National press about Chattanooga's citywide gigabit network and local leaders' passion for and emphasis on entrepreneurs and innovation, paired with the rapid build up of downtown, gave the impression that Chattanooga wasn't just luring developers. Rising housing costs indicated the same thing. "My daughter only had her house on the market for four hours and got an offer, and the offer was $6,000 more than asking and they were going to pay the closing costs," said Lynda Curtis, who owns the Ice Cream Show on the south side of the Walnut Street Bridge and lives downtown. The Chattanooga metro area is struggling on some key economic measures, according to a data analysis by Harvard University and the U.S. Economic Development Administration, which scored more than 900 U.S. metros areas on their economic performance. › The metro Chattanooga gross domestic product per capita, an important measure of prosperity, has increased in recent years to $46,190, but its growth rate — 2.33 percent — ranked 88 out of 100 in the Harvard analysis of economic data. In 2001, the area’s GDP per capita ranked 22. By 2016, it slipped to 36. › The metro Chattanooga average, annual private wage increased to $40,684 by 2016, but its growth rate — 3 percent — ranked 87 out of 100. In 1998, the area’s average private wage ranked 16. By 2016, its ranking fell to 31. › The metro area’s labor participation rate — 76.41 percent in 2016 — has fallen over the last two decades by 3.79 percent. In 1998, the area’s labor participation rate ranked 72, but by 2016 its ranking fell to 80. › The metro area’s utility patents per 10,000 employees — an important measure of innovation — has decreased by 0.63 percent since 1998, according to the most recent data available. In 1998, the area ranked 60 on this measure of innovation. In 2015, it ranked 70. › The number of business establishments in the metro area has also declined slightly over the last two decades from 11,362 in 1998 to 11,242 in 2016. This measure was not ranked by Harvard. › The metro area’s venture capital per $10,000 GDP was $1 in 2012 and had a growth rate of 56.76 percent between 2010 and 2012, according to the most recent data available. Yet, in that same short period, the metro area’s ranking on this measure sank from 11 to 92. › The percent of traded employment in strong clusters, a measure of cluster strength in the metro area, declined significantly over the last two decades. In 1998, the percent of traded employment in strong clusters was 42.7 percent. By 2016 it was 27.35 percent, changing the area’s ranking from 79 to 91 out of 100. The growth rate on this measure, -2.44 percent, was ranked 91. › The metro area is also falling behind on manufacturing intensity. In 1998, nearly 20 percent of all jobs were manufacturing jobs. By 2016, nearly 13.5 percent were. The 6.3 percent decrease was ranked 65 when compared with other cities’ manufacturing growth. Source: Harvard Business School Institute for Stategy and Competitiveness and U.S. Economic Development Administration, www.clustermapping.us. Ranks are by percentile from 1-100 among all 917 U.S. metropolitan and micropolitan statistical areas. Curtis' daughter, who works for her, owned a house near downtown, but had to move farther away from the city because she couldn't afford to stay when her property taxes went up $200 during the rapid build up in local home values over the last few years. "My first thought: What in the world?" However, an analysis of employment and wages in Chattanooga published this summer by the U.S. Bureau of Labor and Statistics offered a more grim assessment. Local employment, according to the analysis, was more highly concentrated in production, transportation and material moving and administrative support, all with wages far below $20 an hour. To cover basic living costs in Hamilton County an adult with one child would have to earn $21.87 per hour, research published by the Massachusetts Institute of Technology shows. The sector with the most growth was tourism and hospitality, which increased employment over the past five years by 22 percent and pays lower wages that would make a high-end apartment unattainable. Nineteen of Chattanooga's 22 major occupational groups "had significantly lower wages than their respective national averages," including management, business and financial operations, computer and mathematical, architecture and engineering, arts, design and media and health care practitioners — the country's highest paying professions. Higher paying jobs also represent a smaller share of Chattanooga's overall economy, when compared to the nationwide distribution. The Chattanooga Area Chamber of Commerce spearheaded the Velocity 2040 community visioning survey throughout the month of October, in part, because they want community help navigating the tough questions that all of these data points present, said Charles Wood, vice president of economic development at the Chattanooga Area Chamber of Commerce. The most desirable companies demand so much that it can be hard to get their attention. A community has to exhibit certain strengths. Chattanooga is an insurance hub, for example. But what other sectors are prominent and can be grown? When communities develop certain areas of economic strength, they also begin to grow a talent pool that in and of itself becomes a magnet for more business growth in those identified sectors, said Wood. Businesses with high paying, desirable jobs are also looking, very closely, at the bones of the community. Does the local airport offer enough direct flights? How are the public schools performing? What is the education level of the local work force? Wood said the Chamber hopes to better identify and grow the area's economic strengths through a strategy called "product development." This includes the Chamber's efforts with Chattanooga 2.0, designed to improve public education; the Velocity 2040 visioning survey; attempts to build an entrepreneurial ecosystem; and support for the airport in increasing direct air service to major hubs. "We fully expect that investing in these and other community assets will create long-term opportunities for all," Wood said. So, if Chattanooga has yet to lure large numbers of high-end workers and jobs, who has been driving up home prices? Shuffling Chattanoogans, mostly, argues Jay Robinson, one of the area's top-producing brokers. Historically, low interest rates allowed many locals to enter the housing market for the first time, and these local, first-time buyers were snatching up entry level homes, which "allowed other Chattanoogans to move up the housing food chain," he said. "Across the board, it is cheaper to buy than rent," Robinson said. The pattern isn't unique to Chattanooga. Now that interest rates are increasing again, many would-be, first-time home buyers can no longer afford a home. A difference of a few hundred dollars — due to an interest rate hike, or a property tax increase, or both — is preventing many from entering the home buying market, and this will have serious implications for all home sellers, said Robinson, who caters to the highest end of the market. "My theory is that each 1 percent increase in the 30 year mortgage rate will prohibit 200 first-time buyers from entering the market. Every first-time buyer triggers about seven sales. So we lose 1,400 transactions. That has happened in the last year," he said. "We have to focus on affordability to drive the entire economy. When the bottom of the market falls out, it becomes a slow burn." Outside investors have also driven up home prices by buying up Chattanooga homes. Most planned to flip homes they scooped up at a low price into rentals. Like developers, these buyers wanted to be poised to cash in on predicted growth and demographic change. A lot of them are now sitting empty, according to a study of property listings by ATTOM Data Solutions published in October . Chattanooga ranked in the top 20 percent of all U.S. cities in its share of vacant homes, according to the study. In metro Chattanooga, 4,483 homes are vacant, or 2.44 percent of all households. That's up from 4,002, or 2.25 percent of all homes, in 2017. The area's home vacancy is now 60 percent above the national average, the study showed. How has the local employment landscape changed in the last five years? Robinson said he is advising anyone thinking about selling in the downtown market in the next year to do it now. Local and national real estate experts are sending similar signals. "Some economy observers are pointing to 2018 as the final period in a long string of sentences touting several happy years of buyer demand and sales excitement for the housing industry," wrote Geoff Ramsey, president of Greater Chattanooga Realtors Association, in his September residential market report. "Although residential real estate should continue along a mostly positive line for the rest of the year, rising prices and interest rates coupled with salary stagnation and a generational trend toward home purchase delay or even disinterest could create an environment of declining sales." In August, Lawrence Yun, chief economists with the National Association of Realtors, told Chattanooga Realtors and home builders to be cautiously optimistic when he spoke at a luncheon. "Even though it's going well, home sales are not going higher," he said. "Affordability is becoming a challenging thing for buyers. We are beginning to sense a diminishing optimism about home buying." Those putting off a home purchase until interest rates fall again will be waiting a long time, he added. "Interest rates will not go down again." Chattanooga has overshot real estate demand before. It's part of the natural boom and bust cycle. A decade ago the area had too many speck homes, Robinson said. Condos, similarly, were once overbuilt. White called it "the condo fatigue." Everyone was building condos around the same time the speck homes were being overbuilt because banks were lending for condos, but few wanted to buy condos at the time. Then, recruitment for the Volkswagen assembly plant, which was announced in 2008, saved the day, right as the recession hit, said Robinson. The jobs fueled the housing demand the real estate market desperately needed at the time. Chattanooga and Hamilton County worked together for more than a decade and invested more than $50 million in property acquisition and infrastructure to prepare Enterprise South Industrial Park for a major employer long before VW began its search for a U.S. plant. This is an application of the "product development" approach to economic development Woods said the Chamber was emphasizing. Right now, banks are aggressively lending for apartment developments. Developers who want a loan for a condo development are required to pre-sell the majority of the units, which is extremely challenging. "We have a rental bubble," Robinson said. White, however, is confident that the market will sort itself out. "People who are investing in downtown Chattanooga and developing projects are smart, savvy business men and women. They wouldn't be investing in our community if they didn't see opportunity and the potential for a high rate of return on projects," White said. "And they're also smart enough to know that buildings can and will change. So, a building that was built for all apartments can remain that way, can shift to make part of the apartments condos, can turn the space into commercial offerings or even a hotel if they believe it's a better fit." Real Estate Partners President Darlene Brown, the marketing and listing agent for Cameron Harbor, one of downtowners newer developments, said she plans to remain invested in downtown. The economy has ups and downs. Real estate has ups and downs, "like the stock market." One condo building at The Exchange at Cameron Harbor will be used for short-term vacation rentals, and she has sold 30 condos in that building, all but two, she said. In the second condo building at The Exchange, which holds 80 condos, 20 are under contract. All and all, Brown said it has been one of her best years in the business. "We keep hearing, 'There is going to be a slow down. There is going to be a slow down.' Those of us who have been in it a long time, we know to stay the course. Interest rates may go up. Stay the course. If the merchandise is priced right and staged correctly, it will sell," said Brown. "If the bottom falls out, everyone is going to have an issue, but I don't think that is going to happen. "We have had a strong run." The city of Chattanooga and River City have taken a "best practice," data-informed approach to downtown. In 2002, Richard Florida, an influential urban thinker, published a book that cities across the country, including Chattanooga, quickly turned into a playbook for economic revival. In a nutshell, Florida encouraged cities to embrace technology, talent and tolerance and compete for the "creative class." The capital would follow, he promised. Installing art in abandoned and blighted areas was strongly emphasized. Coffee shops were emphasized. Five years later, CreateHere, a nonprofit funded by the city's major foundations and created to establish and build Chattanooga's own creative class and place making acumen, launched the Southside revival. Berke's most recent State of the City address introduced his new tagline: "A city of creators." Florida's formula, while successful, had unintended consequences, even Florida, admits. Last year, Florida published a new playbook for cities: "The New Urban Crisis: How Our Cities Are Increasing Inequality, Deepening Segregation, and Failing the Middle Class — and What We Can Do About It." Leaders' approach to downtown, while informed by leading experts and research, may be ill advised, say downtown business owners, frustrated by efforts that have made the city less car-friendly in recent years. While the city and chamber continue to work on recruiting the businesses that will bring more residents to downtown, restaurant and small business owners say downtown parking needs to be made more accessible and either free or discounted, especially for locals. Locals are finding it harder and harder to access restaurants and shops, especially those in the center of the city, they say. The cost of parking has gone up significantly, as well, an added frustration for those with higher rents and mortgages, yet stagnant pay. "I don't care about other cities. If the perception by residents is that parking is inconvenient or too expensive, how do we change that? Despite what studies tell us," said Josh Patton, owner of Chicken Salad Chick on Market Street downtown. The explosion of restaurant delivery service Dinner Delivered, which began delivering for downtown restaurants several years ago, has allowed some restaurants to survive the lack of foot traffic, but it has also contributed to the downtown quiet. "They kept pushing us to downtown. They saw the growth potential. We were a little weary of it," said Megan Swartz Williams, co-owner of the former Noodles and Co. on Market Street. "Everybody would always say: 'I wish we could come more often, but parking is always a problem.'" River City, which studied downtown parking for a year and released the results of that study in January, has downplayed parking concerns. "Current overall parking supply in Downtown Chattanooga is adequate. However, that supply is not optimally utilized which is evident when only less than one-third of those 43,000 parking spaces are available to the general public," a River City summary of the study read. "Furthermore, even when supply is at its highest use during mid-day on a weekday typically, it is much less heavily used on weekends. This further suggests that major additions to parking supply might have limited utility." The mayor is also bullish when it comes to walkability. Some small business owners along East M.L. King Boulevard complained during the recent redesign, which added protected bike lanes and slowed vehicular traffic, but Berke said they later told him that the redesign "had resulted in their most profitable business day ever." "Creating a more equitable and sustainable economy begins with designing our city to be safer and more welcoming for everyone, including those with disabilities or individuals who may not drive," Berke said in an email. "Making sure that all of Chattanooga is as safe as possible for pedestrians, bicyclists, and mass transit users has always been a top priority for this administration." The success of the Southside is a testament to walkability, said Adam Kinsey, president of Choo Choo Partners, which owns the historic Chattanooga Choo Choo hotel that anchors the Southside commercial district, as well as the Passenger Flats apartments. "It is a very walkable and active community that supports the local businesses. The residents are the engine for the Southside growth. As the nearly 2,000 apartment units in the Southside fill up the development will continue to be explosive, but it is very important that the neighborhood does not lose its identity." He said he also thinks some businesses have struggled in the downtown market because they weren't a fit. "People are shying away from chain restaurants and cookie cutter retail options,"said Kinsey. "It is local and regional independent entertainment, retail and food and beverage options that define a city and attract locals and tourists alike." The parking issue is not going away, though, said Kelly, who wants to see the River City board explore parking incentives for locals, a tact used by many other cities. Right now, River City is undergoing a strategic planning process. The nonprofit has also began pushing for downtown property owners to form a business improvement district which could create a funding source to address parking related issues downtown, as well as other issues. Those funds would be overseen by an independent board of downtown property owners paying into the BID. Chattanooga is the largest metro in Tennessee without one. "I think that in a city our size, where free parking is available ten minutes or less out of town, it is not just the cost, it is the convenience," Kelly said. "We have to find a creative way to level the playing field for downtown merchants. Downtown is not yet special enough to where too many people are going to mess with it. A lot of people are staying away because they see it as a hassle." Contact staff writer Joan McClane at jmcclane@timesfreepress.com or 423-757-6601.